The year is ending and with it now December, it's almost time to wrap up my Read the Nobels annual challenge and my little wallpaper project. Over the year, my calendar wallpapers were a fun little way to drum up some interest in the Read the Nobels Reading Challenge for 2016. I've featured 12 authors who have won the Nobel Prize in Literature, featured a book cover, and a quote. Check out the full list down below. How has your Nobel reading been going so far? It is my hope that this challenge has opened up new reading avenues for you! If you noticed, my posts have not been as frequent but I am becoming my more focused on my reading choices in general. My Nobel reading has been slim but manageable and thoroughly enjoyable. I still have Alice Munro to round me up for the year. I will still continue on the with Read the Nobels (perpetual) Challenge so feel free to join in on the blog! Looking for co-hosts! I'd like to continue with this annual challenge. I'm curious if anyone out there -- whether you joined this year or not -- to help me out. Sound off in the comments if you're interested in co-hosting or send me an email at readerrabbit22 at gmail.com. I'd love to hear from you! Now, without further ado, here is December's wallpaper. 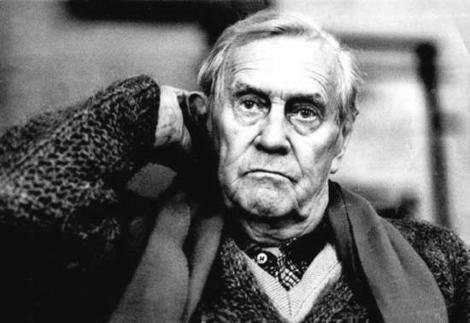 This month features 1973 Nobel Prize for Literature laureate, Australian Patrick White. The Nobel Prize website cites his win thus: "for an epic and psychological narrative art which has introduced a new continent into literature". On the Read the Nobels blog, six reviews have been posted so far: The Tree of Man, Happy Valley, The Eye of the Storm, Twyborn Affair, Solid Affair, and Voss. I think that that is what appealed to me when I picked the quote decided to feature his book Voss*. 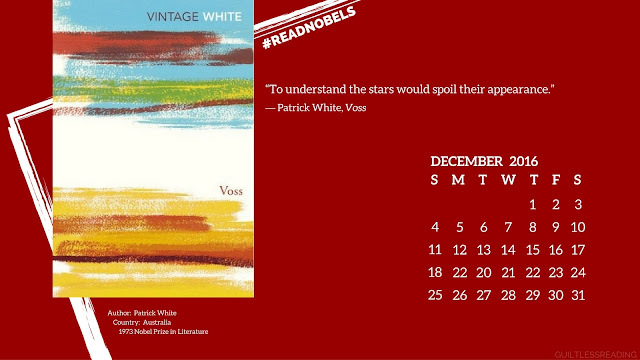 Here's a synopsis of Voss*: Set in nineteenth-century Australia, Voss is White's best-known book, a sweeping novel about a secret passion between the explorer Voss and the young orphan Laura. As Voss is tested by hardship, mutiny, and betrayal during his crossing of the brutal Australian desert, Laura awaits his return in Sydney, where she endures their months of separation as if her life were a dream and Voss the only reality. Marrying a sensitive rendering of hidden love with a stark adventure narrative, Voss is a novel of extraordinary power and virtuosity from a twentieth-century master. 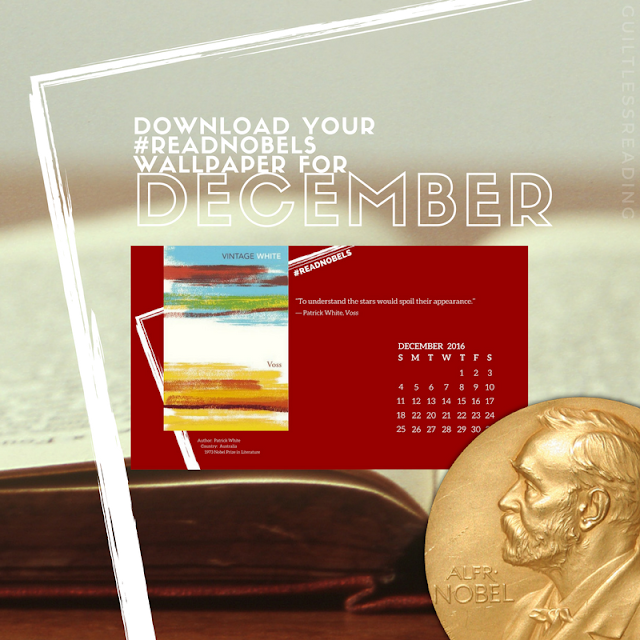 Download the last for year, December's Read the Nobels wallpaper!